Sophisticated international trafficking of ivory in central Africa is being fuelled by high levels of corruption, according to a report published Thursday. "The report's findings show that open ivory markets in the region are disappearing, largely due to increased enforcement and competition with underground criminal networks," Traffic said. "In its place, high-level corruption and poor governance are helping enable sophisticated international trade." Current legislation in the five central African countries prohibits domestic ivory trade, with the exception of Cameroon. However, according to the report there is a "loose and ambiguous interpretation of the law in all countries" and enforcement efforts are hampered by corruption often involving high-level government officials. It also blamed insufficient human and financial resources, mismanagement and weak political will. 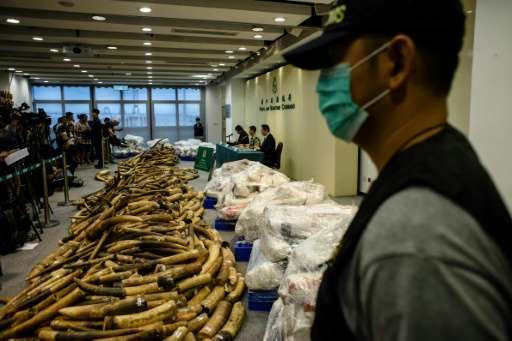 The report said a common theme heard throughout the region were allegations concerning Chinese citizens operating within organised criminal networks as key actors in the ivory trade. In 2014/2015, 80 percent of foreign buyers were ethnic Asians, especially Chinese but also Malaysians and Vietnamese. It is estimated that about 20,000 elephants are killed every year for their ivory tusks, leading to a steep decline in numbers. The international trade in ivory was outlawed in 1989. Traffic said the report, supported by conservation organisation the WWF, is the first comprehensive assessment of ivory trade in the region in nearly two decades. Investigators posed as buyers at ivory markets and workshops throughout the Congo Basin in 2007, 2009, 2014 and 2015. Paulinus Ngeh, director of Traffic in central Africa, said regional governments must ramp up efforts to implement their commitments to stop elephant poaching and illegal ivory trade.